"I had a Stilt Sandpiper in the Shorebird Pool this a.m. milling around with some Lesser Yellowlegs. I found its easiest to pick him out by feeding style. He's the bird that sort of looks like the yellowlegs but feeds like a dowitcher. Update Your Big Year Totals! It's almost September, and we are asking for Meadowlands Big Year participants to e-mail us their totals so far if they have not done so already. Please send them to jim.wright (at) njmeadowlands.gov and include the words "Meadowlands Big Year" in the e-mail). Amazing Free Guided Walk This Sunday! Start the fall birding season with a free, NFL-themed “Back to Football” Nature Walk at DeKorte Park in Lyndhurst on Sunday, Sept. 2, at 10 a.m. The guided, 90-minute walk, sponsored by the New Jersey Meadowlands Commission (NJMC) and the Bergen County Audubon Society, has a special National Football League theme – and nifty prizes. To celebrate the opening game of the 2012 season between the Dallas Cowboys and Super Bowl Champion Giants at nearby MetLife Stadium on Wednesday, Sept. 5, the NFL is offering a prize to the first person on the walk to see any bird species with the same name as a pro-football team: Cardinal, Raven, Falcon, Eagle, Seahawk (osprey), Giant (great) egret (above) and Giant (great) blue heron. All seven team bird species can be seen in DeKorte Park, the home of the NJMC. The walk meets inside the one-square mile park’s Meadowlands Environment Center. Super Bowl XLVIII will be played at MetLife Stadium in East Rutherford in February 2014. You will have to sign a standard liability release that is good for NJMC/BCAS events throughout the year. To rsvp, contact Don Torino of the BCAS at greatauk4@aol.com or 201-230-4983. The Meadowlands Environment Center’s phone number is 201-777-2431. 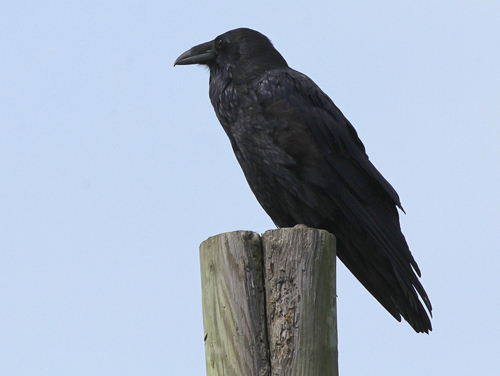 Why is this Common Raven one of the key birds on our free guided walk this Sunday? The answer is on our latest post on the wildnewjeresy.tv blog. What if a computer could identify a Merlin by its photograph? With recent advances in computer vision, this idea is no longer a pipe dream. The Cornell Lab is teaming up with computer vision researchers, the Visipedia team, at UC-San Diego, UC-Berkeley and Caltech to tackle this challenge. To get this effort rolling, we are building a database of 70,000 correctly identified images to train our system to identify 550 North American birds, and we are looking for people to share their images of these species. Click here to contribute your photos! DeKorte Park is open on Labor Day (Monday, Sept. 3) but the Environment Center (restrooms, gift shop, Flyway Gallery) will be closed. River Barge Park and Marina will be open Monday with full bathroom access. 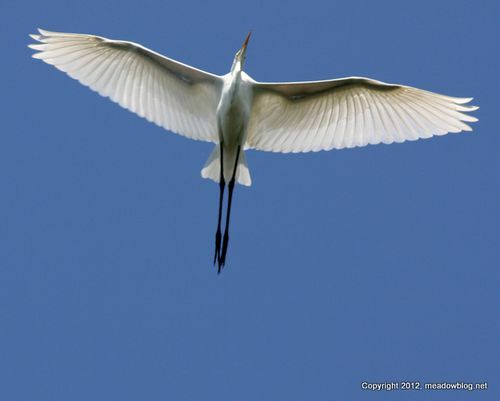 Thanks to all who joined us for our Birding by Boat on Tuesday,and thanks to Denise Farrell for the following report. Highlights included Boat-tailed Grackle, Common Raven, Bald Eagle, an American Kestrel at River Barge Park, and Clapper Rail (heard only). Butterfly notes: Cloudless Sulphur seen at River Barge Park, plus butterflies zipping along the river (in migration?) throughout the cruise. 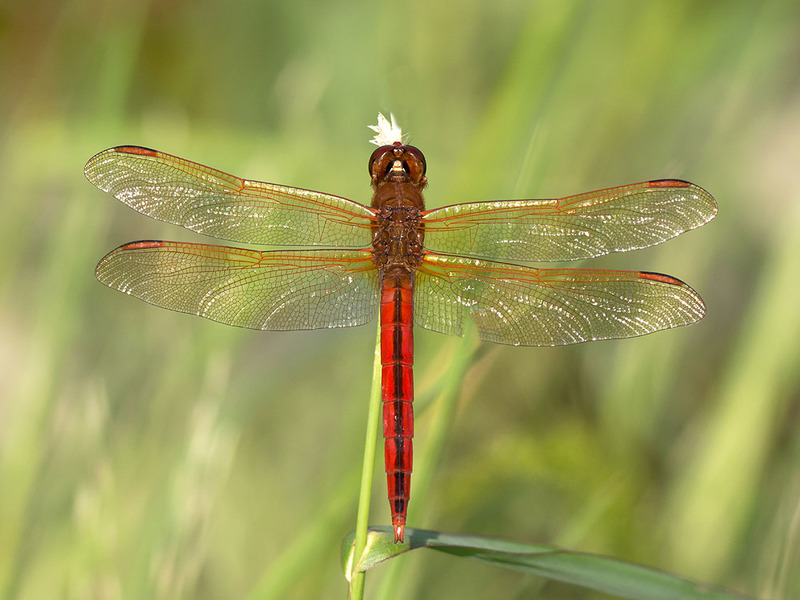 I saw a cool dragonfly species earlier this month along Disposal Road, a Needham's Skimmer (above). They (there were 3) were flying and perching around a large mucky/algaeous puddle that backs up to phragmites between the white trailer and the fenced in machinery with the methane burn stack. There were also twelve-spotted skimmers, black saddlebags, and eastern pondhawk dragonflies, and familiar bluet damselflies in and around the same puddle. The Needham's was a first for me. Kearny has a new butterfly garden in Riverbank Park, and Karen Zautyk of The observer wrote about it recently. The link is here. 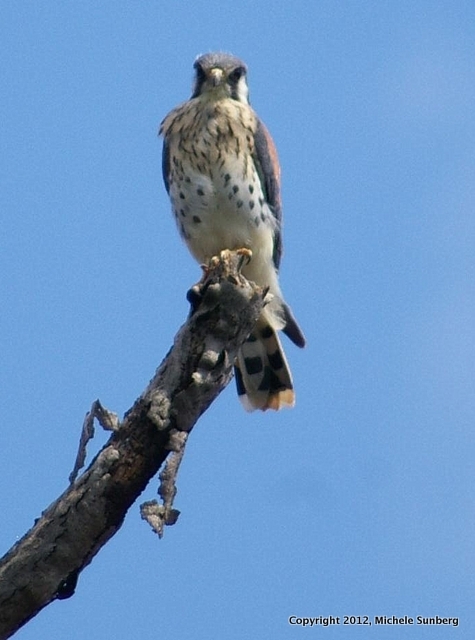 See a Kestrel? Report a Kestrel! 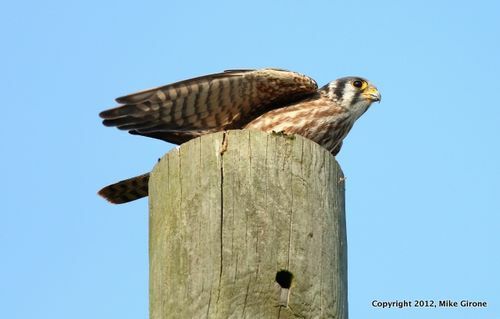 "Keep in mind that with kestrels recently listed as threatened, we're interested in documented reports of them during nesting and non-nesting seasons. "Documented nest sites and recent fledglings are of particular importance, of course." 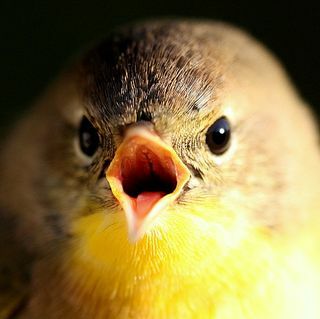 "We encourage you to use our Sighting Report Form found on our website: http://njfishandwildlife.com/ensp/rprtform.htm."